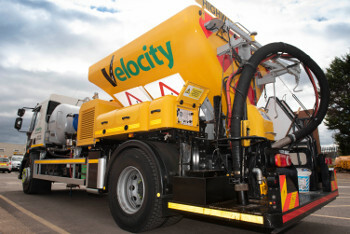 Wolverhampton Council has cut disruption on its roads by using a Velocity Patcher to fill potholes on roads across the city at speed. It has been trialling the approach, which involves patching roads by forcing material into the pothole under high pressure. The hose is initially used to blast the pothole with air, to clear out dirt, debris and water. Using a blend of bitumen and chippings that are passed through a hose at high speed, each repair can be completed in a matter of minutes, the council said, costing less than half of a traditional patch method, but with the same repair guarantee period. Cllr Steve Evans, cabinet member for city environment, said: ‘The Velocity Patcher is a fantastic approach to tackling potholes across our city. ‘Repairing potholes can be time-consuming and costly. With this technique, what would normally take a couple of hours and cause traffic disruption will take a matter of minutes with vehicles ready to drive over it immediately.